Kir2ben Photography at Stone Tower Winery in Leesburg, Virginia. 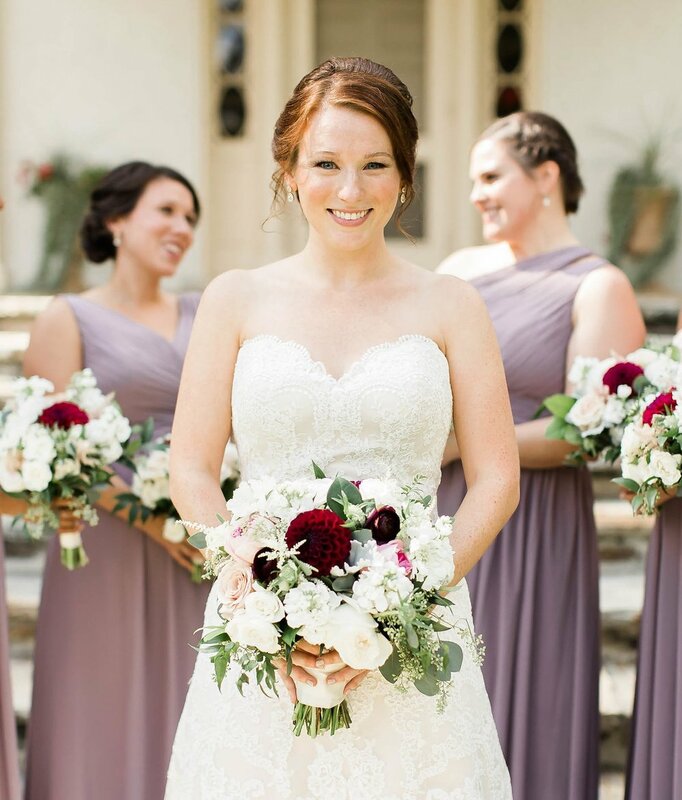 Burgundy could be considered the “new black” in wedding florals, except, of course, there aren’t really black flowers. It seems to be the most popular of the deep, bold colors and wedding couples are using it in a number of different color palettes. Bridesmaid dresses, linens, bow-ties, ribbons and flowers are available in many different shades of burgundy and we often here the color referred to as merlot, wine or berry. Fortunately, there are some really lovely floral varieties in the burgundy family that we’ll use to achieve the shade you are looking for. The design or your florals with burgundy. Deep red Dahlia “tempers” the darker burghundy Scabiosa. Photography by Izzy Hudgins Photography. Like many florists, we’ll want to see the photos and “pins” that have inspired your choice of burgundy during our consultation. There are beautiful designs on the internet (a sincere nod to all of the talented women and men who work in our industry) so I’m sure you’ve found some photos that we can use to begin our creative session. 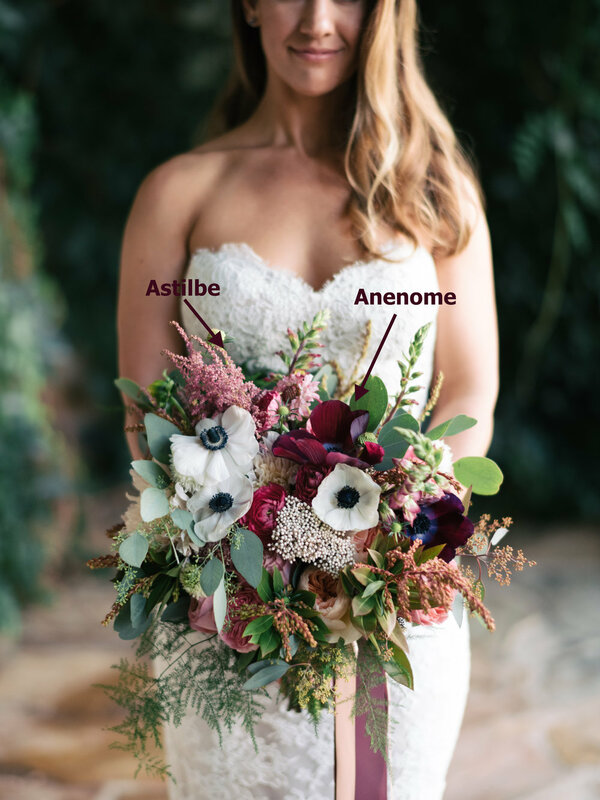 Two of the most popular burgundy palettes include a combination of white and ivory or blush and ivory flowers with greenery. These are truly romantic and elegant combinations that will result in beautiful arrangements for your wedding day. It’s important to keep in mind that the dark and light tones may present a bit of a design challenge. Your floral designer will need to use some important techniques to make sure that your “pops” of color don’t turn into what might appear to look like polka dots. 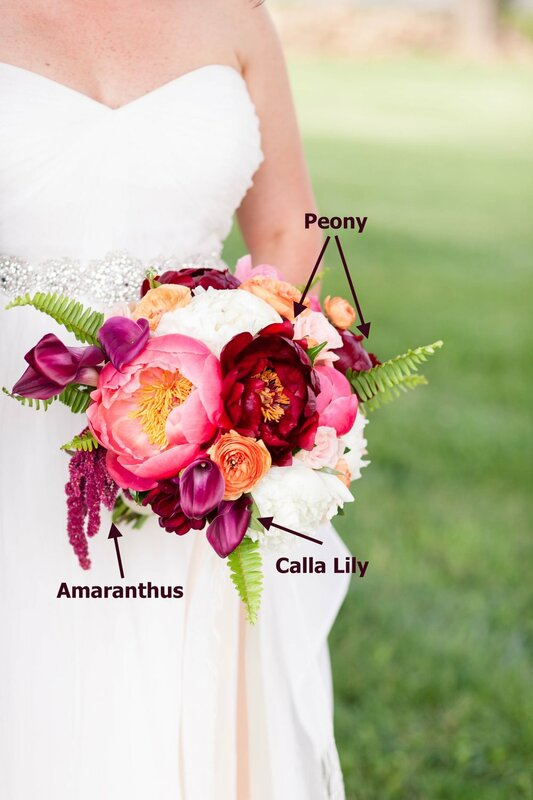 A professional floral designer will select combinations of flowers that will allow the colors to blend a little. In addition, the contrasting colors will be grouped together to create interesting focal points within the design. Lastly, if it works in your palette, your designer may recommend that you a add a dark red or deep pink floral in the grouping to make sure that each flower is visible within the design. I often refer to this as “tempering” the design. If your palette includes more colors like peach, orange and pink, this blending of colors happens more naturally. There are a lot of flowers that can be interpreted as burgundy that we use in our designs for weddings and every day florals. Dahlia is an incredible fall bloom that we can even source locally in early Fall in Northern Virginia. 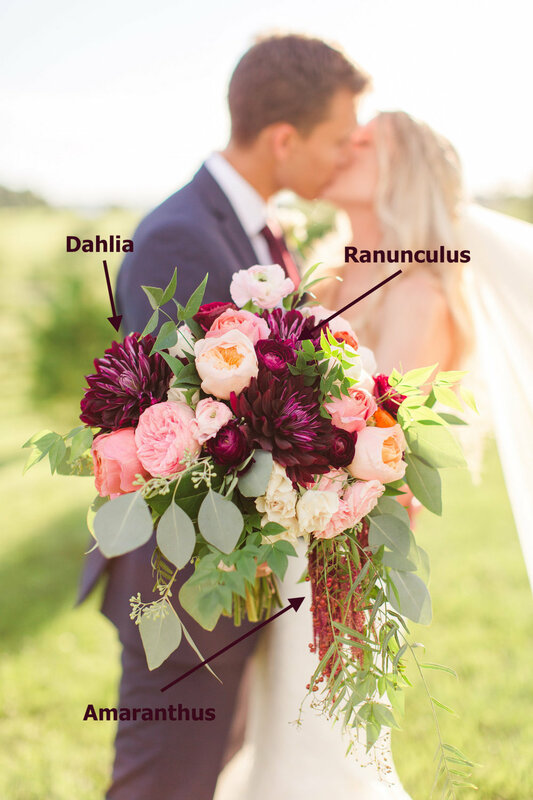 It may be possible to get Dahlia earlier in the year, so, if that is a favorite bloom, ask your floral designer about availability. Mums are simialr to Dahlias with long, individual petals. Scabiosa adds incredible texture to a design and at times can be so dark that the burgundy can almost appear to be black. Ranunculus and Peony are softer blooms that open up beautifully in a design. Peony is a much bigger flower and is truly a Spring bloom. We can occasionally get Peony later in the year but it is less likely. Astilbe, Celosia and Snapdragon are leggier flowers that add texture and interest to a design. Amaranthus is a great flower to use when your looking for a cascade or drape in your bouquet, arch or centerpieces. Similarly, the interesting shape and deep color of Calla Lily offers another shade of burgundy. Burghundy Cymbidium Orchids have a waxy petal and an even more exotic shape. You could also choose Anenome, Hellebore or Cosmos. These come in lovely shades of wine or merlot. These blooms have fewer, larger petals and are flat when they open, exposing their interesting centers. 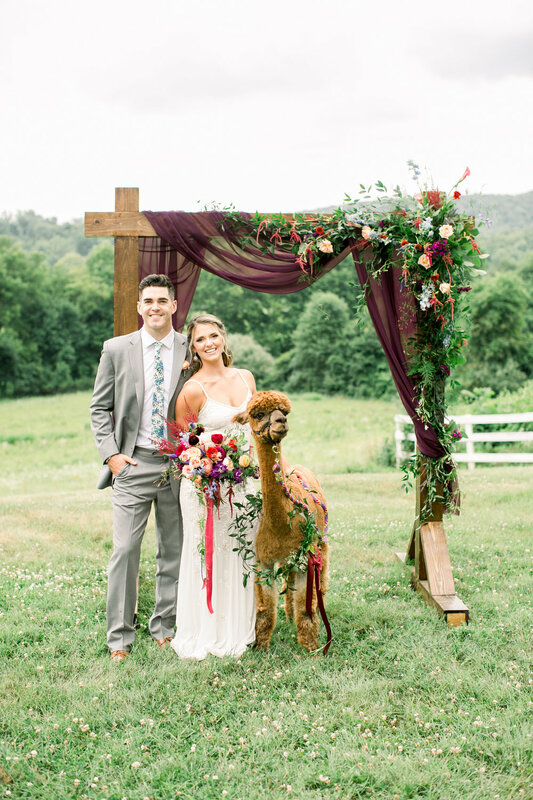 Here are a few other ways to incorporate burgundy into your wedding.